Detail of the artist's studio. A work in progress in the artist's studio. Justin Webb is a painter and sculptor living and working in Philadelphia, Pennsylvania. He is currently an artist-in-residence of The Church Studios at Olivet Presbyterian Church, which is located in the Fairmont neighborhood of Philadelphia, PA. 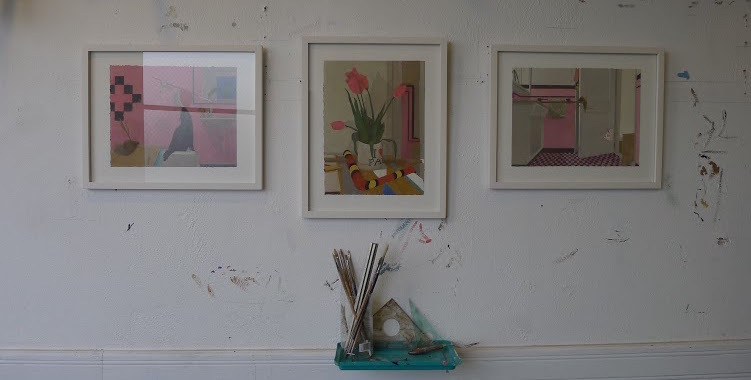 He is influenced by David Hockney, Euan Uglow, and Matthias Weischer, and is interested in exploring the formation of narratives through the mise-en-scène. Through his artwork, he sets a stage, and then constructs a framework in which action will, or already has taken place. He creates domestic spaces that are infused with objects (props) intended to act as triggers for stimulating memories, thus encouraging viewers to develop their own story. Most recently, Justin has exhibited at the Trestle Gallery, NY; The Fleischer Art Memorial, PA; and The Asheville Art Museum, NC. He is also accredited as one of the technicians responsible for moving the Barnes Collection to its new location in downtown Philadelphia. My two most general interests are in composition and narrative constructions. I aim to set a stage and construct a framework in which action will or has taken place. I create domestic spaces that are infused with objects – recognizable, but often out of place – intended as triggers for stimulating memory, encouraging the viewer to develop their own story. In the studio I’ll typical watch/listen to the same set of movies over and over again. Dirty Dancing, Sixteen Candles, When Harry Met Sally, and E.T. the Extra Terrestrial are a few of my favorites. I’m also a huge fan of old time radio shows – horror, suspense, murder mysteries in particular. Though, you’ve got to be careful. A lot of that stuff is strictly daytime listen. It’s a toss-up between a Jasper Johns or Henri Rousseau. I’d take just about any Rousseau, with a slight preference toward the flower still lifes. For a Johns I’d hope for “In The Studio” (1982), “Catenary (I Call to the Grave)” (1998), or “Good Time Charley” (1961). Though, I’d probably just settle for an Edwin Dickinson self portrait. I’m not very much of a reader really.